Nearly half the places available for European students through ICE WaRM’s Australia-Europe scholarship programme for students and researchers have now been taken up. Nineteen students from the University of Dundee in Scotland, the Technical University of Delft in The Netherlands and the Technical University of Dresden in Germany already have signed up for the exchange scheme. Another 26 places still are available.A further 43 places are open to Australian students to study at the three European universities, which all specialise in water studies. 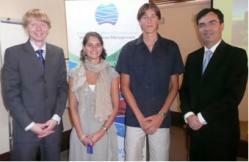 The exchange programme offers students and researchers at ICE WaRM’s five partner universities – the University of Adelaide, Deakin University, the University of South Australia, Flinders University and CQUniversity – five or 10 months at the three leading water studies universities in Europe. The scheme allows final year undergraduates who are considering taking on postgraduate education in the field of water to complete six months of their postgraduate studies in a water-related discipline in Europe. All student classes are taught in English. Funding for eligible students includes a generous travel grant and monthly subsistence allowance. Assistance in organising travel and accommodation is available for staff exchanges. The University of Dundee is the coordinating institution for the European partners, while ICE WaRM is coordinating the Australian applications.